So, I've been wanting to post about these damned anklets for about a month or more now! I've been holding off to allow me time to go outside to photograph them against the beautiful backdrop of autumn leaves. Dudes, if I held off photographing them any longer, you were not going to see them until 2010 or later. So, tonight, I snapped snapped snapped some photos and came back to my computer and promptly uploaded them. I knit these suckers using size zero needles. 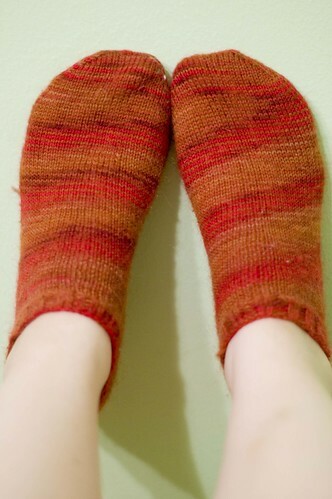 It was my first time knitting non-baby socks on such tiny needles and I found it to be slow going, but I ended up loving the look of the tiny knit stitches so much, I might be a size zero needle convert. The evenness of my stitches. The perfection of my stitches! It was amazing. If only I liked this colorway or yarn more. I ended up not loving Schaefer Anne yarn, sadly. I find it slightly scratchy while knitting and slightly fuzzy once knit up. You can see the halo of the yarn a little better in this picture. I'm quite happy that my remaining untouched sock yarns are all semi-solids as I've been unhappy with my variegated yarns recently. I will say this for Schaefer Anne yarn -- it goes through a washer and dryer beautifully. While sick, I decided to toss them into my wash to see what happened. They bled hideously and I now have a slightly pink (previously light blue) tee, but they held their shape perfectly and are now soft enough for wearing around the home comfortably. They are also one of the few sock yarns I've worked with that make gorgeously thin socks that fit perfectly into my shoes. As for the fact that they are anklets, as are most of the socks on my site? 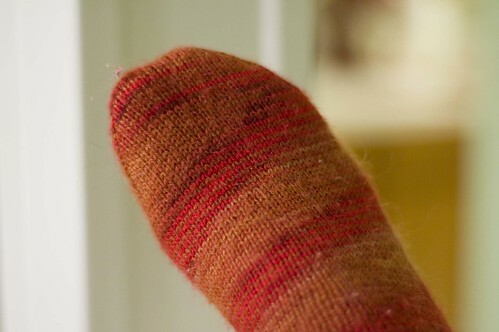 I have a horrible confession to make for a sock knitter. I hate socks. I only wear anklets at all (machine made or hand knit) and I mostly only wear them into bed. The anklet size allows me to kick them off once I get warm and sleepy enough. If you're wondering why I hate socks, it's all about constriction. I hate clothes that make me feel constricted. I also dislike tight clothing, shoes with backs, and turtlenecks. Dear God above, I really hate turtlenecks. Saying all this, I'm still tempted to work some Cookie A socks next with my semi-solid yarn. That is, I'm tempted to do so if I ever get my scarf done. Chances of that? Slim to none. Love you all and I hope to post soon. I am actually crafting once again! That colorway is awesome!!!! The anklets turned out great! Heh. 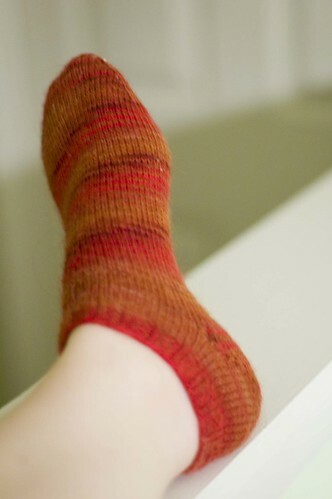 I'm not a fan of the 6" leg on socks, so I usually make mine 2-3" and go to the heel from there.